Wow – part 7 – this is now (I think) officially the longest running series that I have written and not forgotten to finish it (don’t worry this is not the end, there is one more part to go). Took a little while to get this one off the deck as there are a few steps in this post that we need to go through. In retrospect I should have perhaps done a video for this – but I am trying to work through a “lip smacking” problem that someone commented on you of my “You Tube” videos that has left me a little self conscious. Actually it hasn’t – I don’t care – I just didn’t think of doing one . Creates Mailbox Databases from the command line. Sets the Offline Address Book to the “Default Offline Address Book”. Creates a copy of the new database on each node within the DAG. You can copy and paste the script from this webpage into a new PS1 file on any of the Exchange Servers that we have created in this LAB – or you can download it from the download link below. Set-MailboxDatabase $DBName -offlineAddressBook "Default Offline Address Book"
UPDATE – 29/03/2013: A reader of this site requested a CSV enabled version of the above script – I have included it below with a sample CSV file should you wish to further automate the process of Mailbox Database Creation. Execute the script from the command line (with no parameters) and you will be asked to navigate to the location of the CSV file which contains the Mailbox Database Information – the script will then create the databases and add the mailbox database copies. -DBName / The name of the database – if you plan to use spaces please enclose this in inverted commas. -DBPath / The physical path to the Exchange edb file – you do not need to provide the name of the database file as the script will create this for you – do not include a trailing slash at the end of the path. -LogFilePath / The physical path to the log files location. You do not have to have created any folders for the logs or databases as the script will also create these for you. .\CreateMailboxDBs.ps1 -DBName "London_Office" -DBPath "x:\ExchangeDatabases\London" -LogFilePath "x:\ExchangeLogs\London"
When the script executes you will see information similar to the following screen shot. The script will also pause whilst it seeds the databases on the other servers. When the script has completed its actions – you will see the following output from the script. You can then open up the Exchange Administrative Centre and check that your databases correctly – see below. On either art-CASMBX-01 or 02 open am Exchange Management Shell Window and type in the following command, ensure that you include all the domains (SAN’s) that you would like registered on the certificate within the –DomainName parameter (separated by commas) – see below. 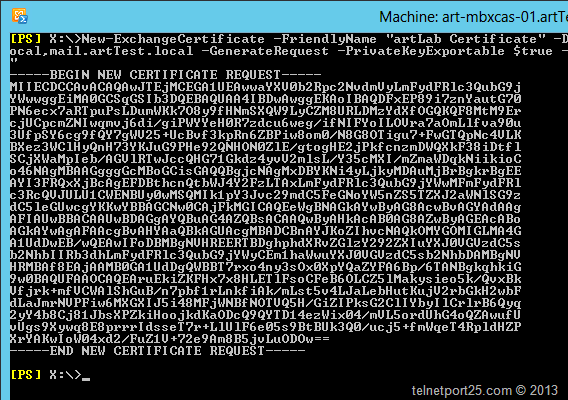 New-ExchangeCertificate -FriendlyName "artLab Certificate" -DomainName autodiscover.artTest.local,owa.artTest.local,mail.artTest.local -GenerateRequest -PrivateKeyExportable $true -KeySize 2048 -RequestFile "x:\DomainCSRRequest.csr"
This will generate a new Certificate Signing Request (CSR) that we can submit to the Active Directory Certificate Services component which is installed on art-DC-01. The command will output a CSR file to a location that you specify which will contain text similar to that in the example below. Open Internet Explorer on your Exchange server and navigate to http://art-dc-01/certsrv (or the name that you gave you domain controller). 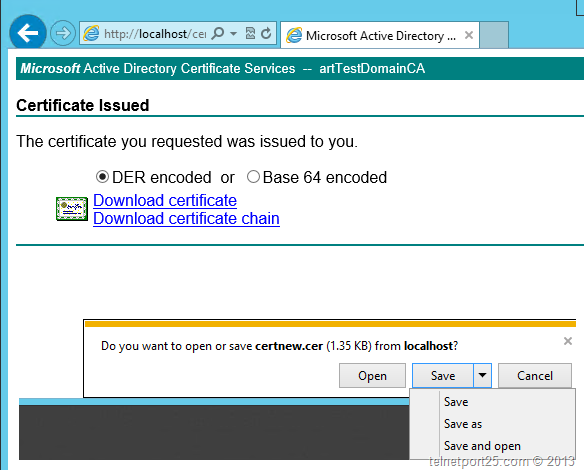 From the screen that appears – click on the “Request a Certificate” link – see below. 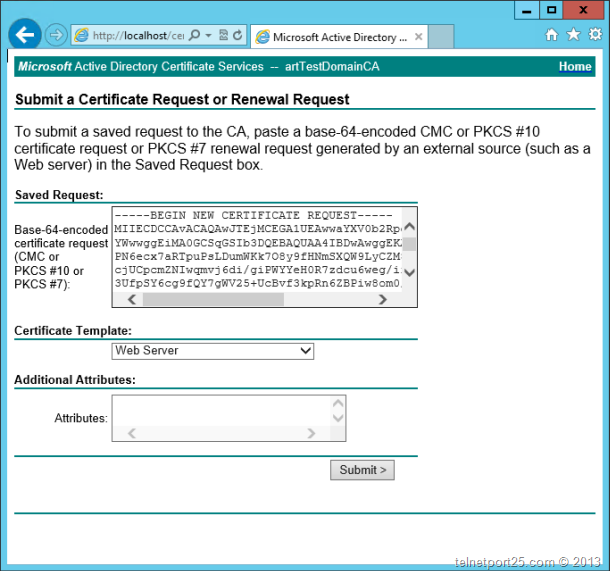 Open the CSR file that you created using the New-ExchangeCertificate cmdlet – and copy and past its content in to the section on the next screen entitled “Base64 encoded certificate request (CMC or PKCS #10 or PKCS #7)” – ensure that the certificate template is set to “Web Server” and then click on the “Submit” button – see below. You will be redirected to a screen where you can now download your certificate – click on the “Download Certificate” link – see below. From within the Exchange management shell type in the commands below, ensure that you provide the path to your certificate file that you downloaded. Note that you will need to provide the thumbprint for the imported certificate when you use the Enable-ExchangeCertificate – bear in mind that the THUMBPRINT of the cert is likely to be different from that in my example. 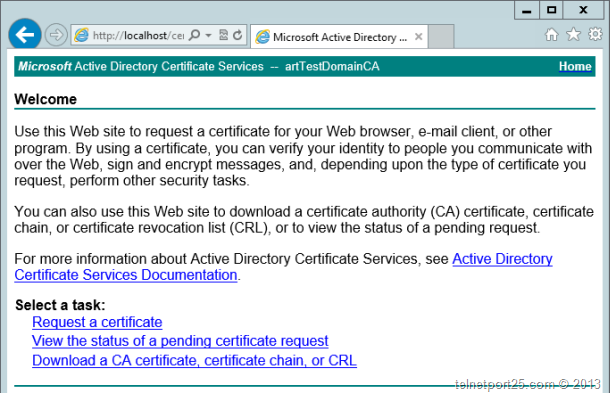 The commands below also enables the certificate for the web services (IIS). You will be prompted for a user name and password – enter in admin (not used) as the user name and select a password that will be used as the private key (you will need this when you import the certificate into art-MBXCAS-02). Remember that this time around, we are using the –Server parameter to stipulate that we want to allocate this exported cert on to art-MBXCAS-02. You will be prompted to supply the password that you selected when you exported the certificate in order to complete the import operation. Again, remember that the thumbprint will be different on your system – also remember that you need to stipulate the –Server parameter to make sure that you are working against art-MBXCAS-02. It is important that these also appear within DNS within the LAB. 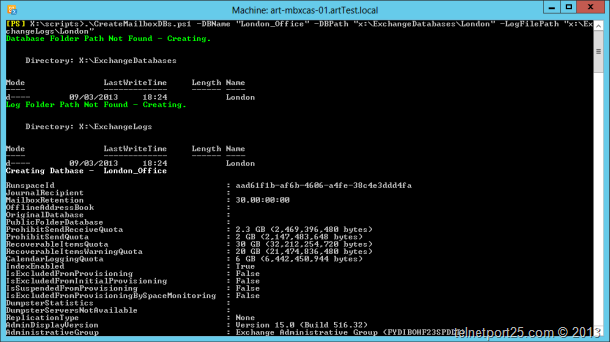 In order to create these – logon to your LAB domain controller (art-DC-01) – and open a Powershell Command Prompt. Type in the following commands – substituting the IP addresses where appropriate to match that of your own subnets. Like in previous versions of Exchange there are a number of internal URLS that need to be configured to ensure that services such as the EWS, Autodiscover and OWA work correctly. One significant change is that there technically no longer the concept of –InternalURL / –ExternalURL on the autodiscover virtual directory. These are now handled via Service Connection Points (SCPs) in Active Directory and for the purposes of our LAB don’t need modification. In Exchange 2013 there are a number of Virtual Directories that you change the URL settings on – therefore I have provided the following script to automate the process for our LAB. NOTE: This script ONLY modifies the InternalURL namespaces – it will need modification if you wish to use external URLs. Furthermore it does not make modifications to the OAB Virtual Directory. As with the previous script – you can copy and paste it from here – or download it from the link below. Set-ClientAccessServer –id $CAS –AutodiscoverServiceInternalUri "https://autodiscover.$InternalDomainName"
Set-ActiveSyncVirtualDirectory -id $aSyn -internalURL "https://mail.$InternalDomainName/Microsoft-Server-ActiveSync"
Set-EcpVirtualDirectory –Identity $eVdir –InternalURL "https://owa.$InternalDomainName/ecp"
Set-WebServicesVirtualDirectory –Identity $webSvc –InternalURL "https://mail.$InternalDomainName/EWS/Exchange.asmx"
Set-OwaVirtualDirectory –Identity $oVDir –InternalUrl "https://owa.$InternalDomainName/OWA"
Set-PowerShellVirtualDirectory –Identity $psDir –InternalURL "https://mail.$InternalDomainName/powershell"
The script will then execute and configure the relevant internalURLS for each service. 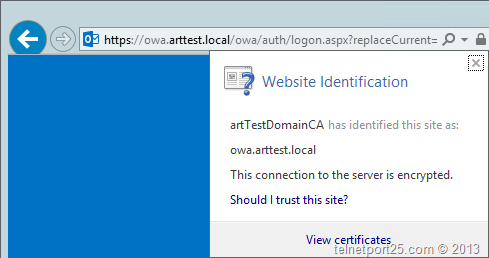 You can then navigate to https://owa.artTest.local/owa and you should see that the certificate is trusted and everything functions as you would expect. Populate the lab with test users. 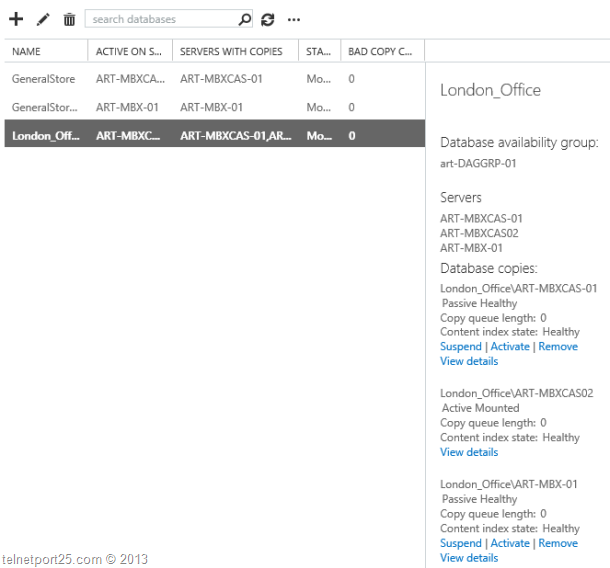 Thanks for the wonderful series, Exchange 2013 Lab setup setup series is awsome. Need your help , Can you modify the CreateMailbos db script where multiple DB’s can be crated from CSV for Exchange 2013. Hiya Sridhar – I have sent you a mail with the modified script. I will also be adding it to the article above so others can make use of it should they wish. Why you can using -DomainName without dc, cas, mbx server names? I create exchange certificate with without dc, cas, mbx server names and client side with prompt error and showed it is no valid certificate.